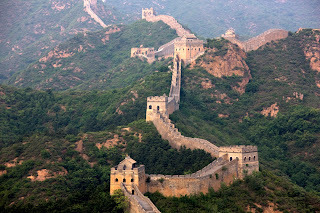 Great Wall of China on the list of Seven Wonders of the World, which became a masterpiece of the world. Throughout the years, this building became the object visited by tourists from all over the world because of the rich history. Great Wall of China was built centuries ago by Emperor Qin Shi Huangdi during the Qin Dynasty in about 221 BC. This wall was built as a barricade against attackers such as the tribes of nomadic Hsiung Nu originating from Northern China. Wall built by the people living around it, with the prisoners and soldiers. Over the years, this wall has been modified with additions made in the next 200 years, such as cannons and towers. In fact, Emperor Wudi of the Han Dynasty contributing towards the construction of this gigantic project, covering up to Yanze Dunhuang and is known as Lop Nur. Wall located along the eastern Shanhaiguan to Lop Lake to the west. Its length reaches approximately 8.852.8 km, with a shape that allows travelers to see scenery of the river and the hills around the walls. Great Wall of China Height approximately 30 feet wide and 15 feet. At the start of construction, the walls was built of stone and wood. The use of brick is a later development. The first builders to use materials that are readily available. For example, because it is located in the mountains, they use stones because it is close to mountains and dense with trees, they use wood. How long will it was built? 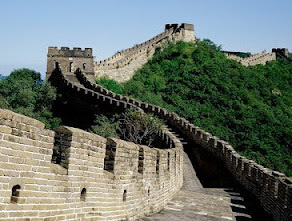 The purpose of the Great Wall of China is to protect China from invaders. According to research by archaeologists, the construction of the wall begins around the 6th century BC and 7 BC. Technically, it is not known who actually start the construction, let alone the emperor of the Qin Dynasty had made ​​significant changes and additions to the Great Wall of China. Not easy to build walls of wood, stone, soil, and grass. Not to mention when it was replaced by a brick wall that has to go through the process of transport using animal power and labor to the top of the mountain. It's really amazing that the creation of man attracts many people from around the world. The impressive structure was built of so many hands and lead us on an impressive history. There is so much we can learn from the wealth of architectural history as the Great Wall of China.